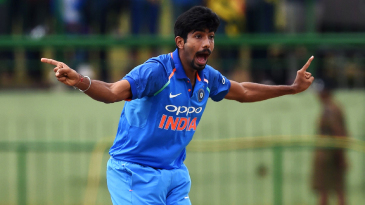 Sri Lanka's on-field embarrassment became their off-field shame, as a bottle-flinging Pallekele crowd caused a 35-minute disruption before India were allowed to knock off the final eight runs that won them the match and sealed the series. Plastic bottles began to be flung from the two grass embankments during the 44th over. Riot police were eventually required to clear those areas before play could continue. The incident came at the end of another one-sided match, even if it did have one tense period. For 40 minutes, after the seamers had struck, and Akila Dananjaya was threatening to make a charge, Sri Lanka were in the hunt - India hemmed in at 61 for 4. But as has been the case right through the tour, the visitors needed to only withstand that brief period of pressure. Their batsmen soon broke the siege, and then set about cruising, risk-free, towards the target. Having sewed up the series now, India are free to trial new combinations, or pursue a 5-0 result to go with their whitewash from the Tests.